Compared to the beginning of the year, especially Greek and Portuguese, bond yields have come down quite a lot during the year. 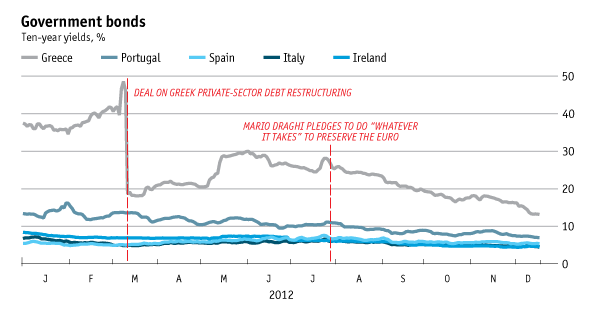 As is noted in the graph the Greek debt restructuring for Greek debt and the verbal commitment by the ECB president Draghi in July dampened the exit and breakup risk and hence brought down sovereign debt yields. Where will the bond yields go in 2013? Thank you for sharing the chart, this is what I need to find.